What's the difference between the short elite and the regular elite? I seriously broke the side of my right foot (below the baby toe) and have not been able to walk on it for over 6 weeks. I'll be getting the cast off soon and don't like the walking boot my dr carries. I'm looking at getting the elite but wondered which one is better the short or taller one. Also I wear a 10.5 shoe (women's) and have a bigger sized calf which size do you recommend? Thank you! The difference between the Short Elite and the Standard Elite, is the length that it goes up on your calf. The short is shorter, and the Standard is just below the knee. You would fit in to a size medium. I fit in kids snow boots so I bought an extra small in the air cast elite. The top of my big toe is off the front of the cast and you can see my sock at the sides of the boot. Is this okay? Or is the boot too small? Just got my boot yesterday 2 weeks after surgery for ruptured Achilles. I slept with it on last night, and when I woke up, the air chambers were nearly empty. Is it normal to have to pump back up after several hours, or do I have a slow leak somewhere? Is the Airicast XP or the Airiest Airselect Elite better for people suffering from achilles tendonitis and heel spurs? I had surgery done on my right ankle and came out of a cast then placed into this boot for a couple months. I currently have a plate and six screws in my ankle. My job consists of alot of standing and walking. 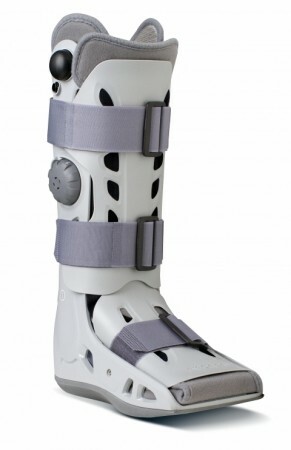 I'm in need of a brace that would offer me similar support as this boot did. Need some guidance on which brace to purchase. Thank you. The most supportive ankle brace we carry is the Velocity ankle brace. The brace comes in three different support styles from Light support to Extra support. It is a hinged ankle brace that fits into a shoe. I recently purchased a medium FP Aircast but I think it may be to small because my toe comes to the very edge of the boot but does not hang over. I wear a women's size 11 shoe and was afraid that the large might have been to big. Should I go with the larger size or is this fit just fine. I purchased the FP but was thinking of getting the Elite, I have a fractured Tibia and torn ligaments which Aircast better accommodates this injury? As long as your toes are not hanging off the end you will be ok in this size. If your toes hang off then you will want to go up to the next size. I have subluxation of my peroneal tendons and have surgery after this semster of college. What tall boot would you recommend that will be the MOST durable as I have had this issue for almost two years now and have gone through many of your boots! I have a non-displaced fracture in my right fibula and was fitted with an aircast elite walking boot. I was told that I can wear this same cast to bed and to cover it up since it was used indoors/outdoors. I was wondering if there is a softer more comfortable cast model that can be used for sleeping. Otherwise I will probably wish to purchase another aircast just for sleeping. The thought of wearing an outside boot to bed is not to my taste. we do not have a softer walking boot only the boots that are on our website. If you want to wear something else to bed you should speak to your physician about something different. I have several severe breaks in my leg, ankle and foot. I have been NWB for the past three months. I will begin putting weight on my leg next month. I have a rather large calf and small foot and I am having trouble finding a boot that fits. What is the best boot for me? Which boot is best for a ruptured Achilles tendon? Hello, what size of calf will the X-Large Airselect Elite accommodate? The Aircast AirSelect Elite will accommodate up to about 17in calf circumference. YOu can't take the padding or liner out so you will have to wash by hand with mild soap and water aand let air dry. What is the difference between the air select elite and the standard? I have recently fractured both bones in my ankle at the joint. i have had surgery and my ankle is now held together with plates and screws. My surgeon says I cannot have any weight on the ankle for at least two months. Does the Air Cast boot eliminate any weight bearing from the ankle? In other words, can I use this boot , or another product, to safely protect my ankle from weight bearing and walk with this product? The AirSelect Walking boot will immobilize the ankle but in order to be Non-wieght bearing you will have to stay of your foot. To be non-weight bearing you will have to use crutches of a walker to get around and not put any wieght on the foot. Hi, can i know do u ship Aircast Airselect Elite to Singapore and how many days wil it takes? How about the final price inclusive of any other charges. What boot would you recommend for a stress reaction of the navicular bone? My 11-year old daughter is currently using a MaxTrax Air Walker Boot, but it appears to me that your brand would be better, as she would not have to manually inflate it every time. It also looks like your boot may provide a faster edema relief. The Max Trax Air Walker is our boot as well and will provide the same support and compression as the Air Cast. I currently am using the Aircast AirSelect Elite and the upper velcro strap broke. Can this strap be purchased to be replaced? My foot loves this and so do I. Very happy to be able to remove it when I want to, but thrilled to have the protection and support when I'm up and around. I have chronic ankle issues and frequently am in a walking cast. I usually just buy the Aircast for a lower price. Howver, this time I splurged and paid the $225 for the higher level cast. Within 1 week the Velcro broke and the bottom sole had a bald spot. Save your money and buy the lower prices XP. Been wearing this for a week now and it has been a true blessing. I feel no pain and I still have mobility. Excellent product. The cast if very supportive and reduces pain. I like not having to carry around the blue bubble to inflate, its all self contained. I had an old ankle sprain that I aggravated dancing in high heels. It Was 2 months before I went to Dr thinking it would go away. I finally went today and was given this boot. I can finally walk with no pain!!!! I love it.